The opening of the first Sikh temple in Leicester, Guru Nanak Gurdwara, in 1970, reflects the growth of the city’s Sikh population in the 1960s and 1970s. By 2011, the Sikh population of the city had risen to 14,457, representing 4.4% of the city’s population (compared to 0.8% nationally) (Office for National Statistics, 2012). This Sikh presence continues to contribute very significantly to the social, political and religious life of the city and is especially evident at the annual Vaisakhi celebrations, attracting thousands of people from across Leicester and the Midlands, to a parade through the streets of the city centre. Perhaps less well known are the nine gurdwaras currently operating in the city of Leicester, and a further two within Leicestershire (in Oadby and Loughborough). Gurdwaras are usually named after one of the Sikh gurus, and though they are often unobtrusive, they can always be recognised by the characteristic nishan sahib (flagpole), which denotes a place of worship. 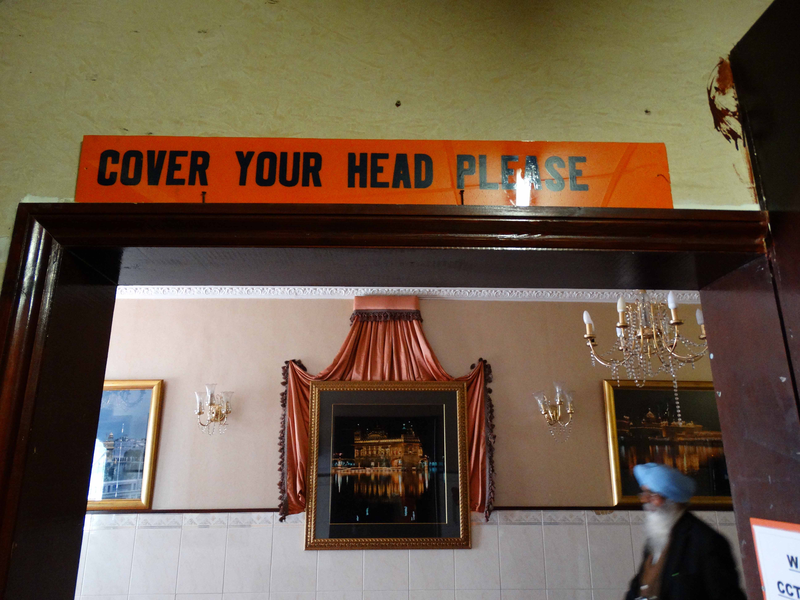 Although gurdwaras all share a focus on the Guru Granth Sahib (Sikh holy scriptures), and on remaining useful and relevant to Sikh communities, research about gurdwaras in Leicester demonstrates the complex nature of their development, influenced by diverse migration histories, and local and international political landscapes. 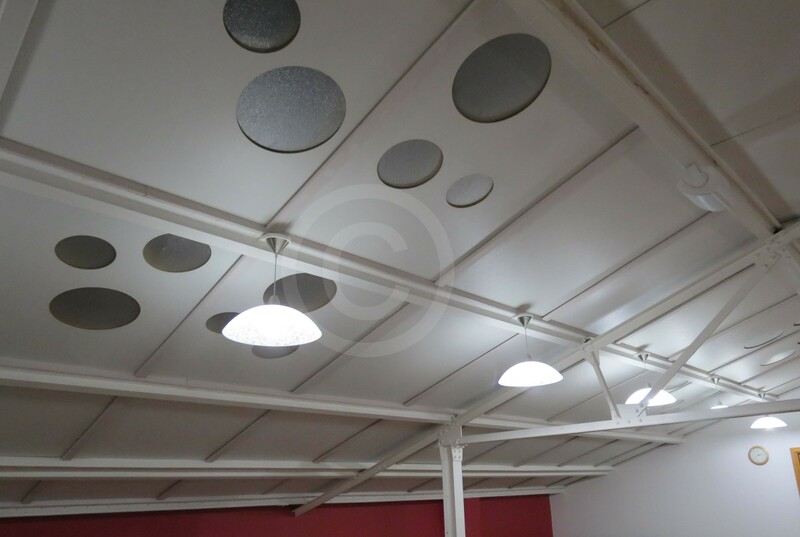 They are commonly understood, in Leicester and elsewhere, to follow general development patterns, beginning with the hiring of temporary spaces or gatherings in residential properties, before moving to existing larger buildings or purpose-built structures. There is no predetermined architectural form to which a gurdwara must adhere, and so their architectural character varies between localities, influenced by local vernaculars and the design wishes of individual communities. The early development of gurdwaras in the city reflects the diversity of emerging Sikh communities. Parallel with the opening of Guru Nanak Gurdwara at 5 New Walk, was the creation of Guru Tegh Bahadur Gurdwara at a residential property on Gwendolen Road, in the same year. Each gurdwara is managed on an individual basis, usually by a small team of elected representatives from within the community, and it is locally perceived that the latter opened as a result of disagreements regarding the style of management at Guru Nanak Gurdwara. Two years later, in 1972, the Ramgarhia Gurdwara opened at 51 Meynell Road at the site of a former warehouse. Ramgarhia Sikhs in Leicester had largely migrated from East Africa following Africanisation programs in countries like Kenya and Uganda in the late 1960s and early 1970s. East African Sikh migrants tended to arrive in Britain as whole family units, whereas earlier migration from India consisted predominantly of single males, whose families later came to join them. 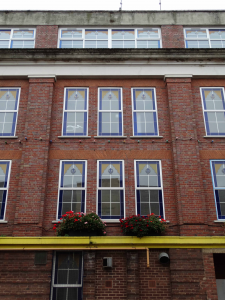 A final early institution was established in 1977, when the Sant Nirankari Mandal opened at the former premises of Society of Friends and Wycliffe Society for the Blind, at Prebend Street in the city centre. This sect is often seen as peripheral to mainstream Sikhism due to their belief in a living human Guru. Both Guru Nanak and Guru Tegh Bahadur gurdwaras later moved to former industrial properties. The 1980s witnessed the significant decline of industry in Leicester and the East Midlands, and in 1989 Guru Nanak Gurdwara opened at a former factory and warehouse at Holy Bones in the city centre (figure 1). The building remains industrial in character, though a first storey extension and entrance gate have been added, contributing to a more visible Sikh architectural style. Guru Tegh Bahadur Gurdwara relocated to a former saw mill in 1976, and a shoe warehouse at East Park Road in 1989 (figure 2). Adaptations to the buildings can be charted through the local planning process, but community stories related to the redevelopment of previously used buildings often focus on their practical contribution to the works. At Guru Tegh Bahadur, for example, thousands of wooden racks were removed by members of the sangat (congregation) in preparation for its religious use. The building was gradually renovated as funds allowed, initially establishing suitable spaces for the darbar (prayer) and langar (blessed food) halls. It now houses two darbar halls, a museum, a library, office space and other areas dedicated to education and wellbeing. Stained glass windows were installed in 2000, and a two-storey entrance lobby with a porch and lotus-shaped dome were later added in 2009, again offering a more distinctively Sikh facade. The industrial buildings offer Sikh communities open spaces, suitable for the gathering of large numbers of people, unlike earlier residential properties. Religious buildings too offer ready-made spaces, requiring little in the way of conversion for use. In 1992, Guru Amar Das Gurdwara opened in a former Baptist Church on Clarendon Park Road, and few structural alterations have since been undertaken (figure 3). 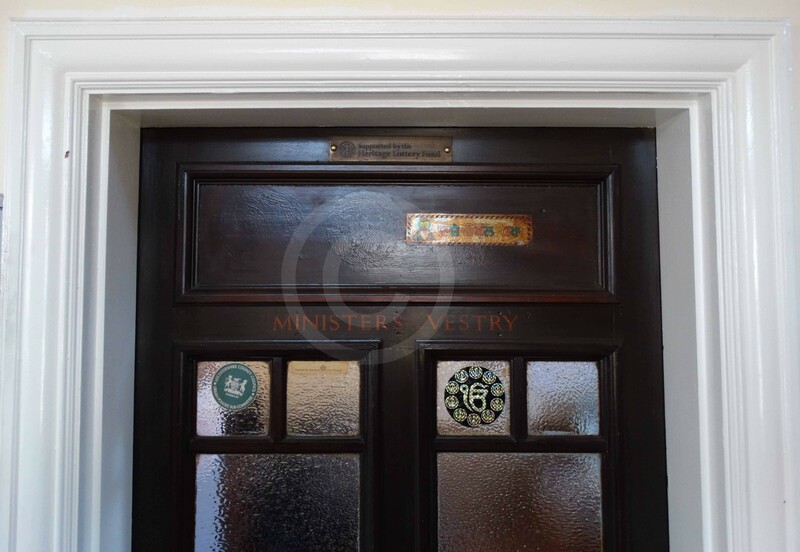 Here, the original windows, and internal fittings such as the doors still remain (figure 4). A year earlier, in 1991, the first purpose-built gurdwara in Leicester was established in the Belgrave area, at Harrison Road. Guru Ravidass Gurdwara has a langar hall, kitchen and lobby area on the ground floor, and a darbar hall above. It is adorned with several lotus-shaped domes painted gold (figure 5 – top of page). Three more gurdwaras have since been established in Leicester. In 1998, Gurdwara Shri Guru Dasmesh Sahib opened at the former Gypsy Lane Hotel. It later doubled in size, with the addition of an extension to the rear of the property. In 2005, Gurdwara Gur Pranth Parkash was established at former Territorial Army and prison offices off Welford Road. 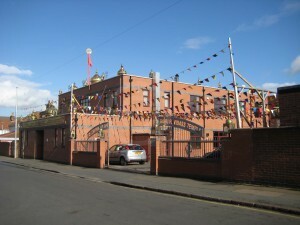 Finally, in 2007, the Namdhari Gurdwara opened above a factory on Linden Street in the Spinney Hills area. Namdhari Sikhs also believe in a human Guru, though the Guru Granth Sahib is also central to their faith. The ceiling panels here make direct reference to a structure in the Sikh homelands; they have been punctured with holes corresponding to those on a memorial in Mayerkolta, India, dedicated to the 1872 martyrdom of 66 Namdhari Sikhs (figure 6). It is not necessarily an end goal of gurdwara communities to build their own property, nor to make significant decorative changes to the exterior of their buildings. 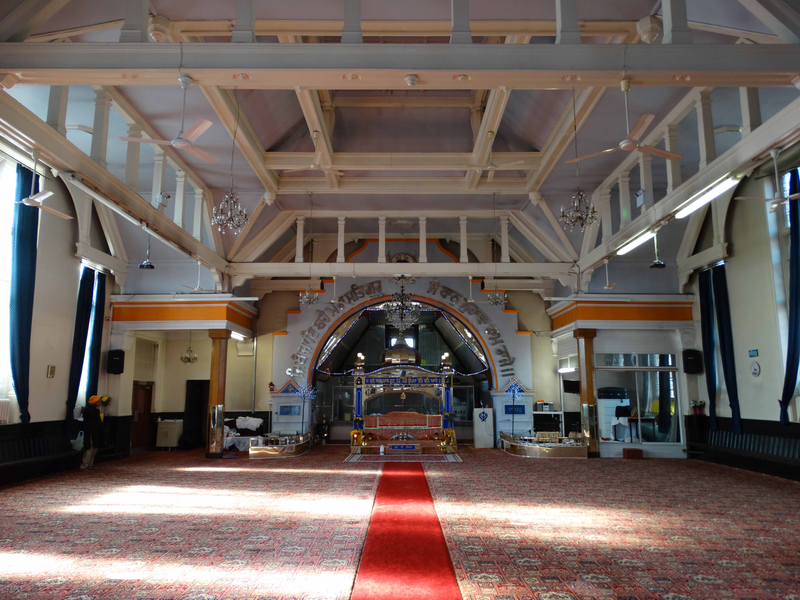 Just one of the nine gurdwaras in Leicester has been purpose-built, and re-used property retains original character, whilst being adapted for new social and religious uses. In some cases, planning applications have been submitted over the past decades for exterior works which have never come to fruition. At Guru Nanak Gurdwara, for example, several applications were given conditional approval, including for a three-storey extension and decorative roof details, but have yet to be carried out. Successive management committees at the Ramgarhia gurdwara have also worked towards the design of a new, purpose-built building. Having dropped a proposal for a new gurdwara in the 1990s, the community are again developing plans for a new place of worship, now of a ‘contemporary’ design. In Leicester, the Sikh community is diverse and gurdwaras have developed according to the wishes and desires of individuals and community groups. Although the aesthetic character of gurdwara buildings is clearly of consideration, the central focus is always on social and religious practices, and the demonstration of values at the heart of Sikhism. A whole range of buildings in the city have proved suited to these purposes. 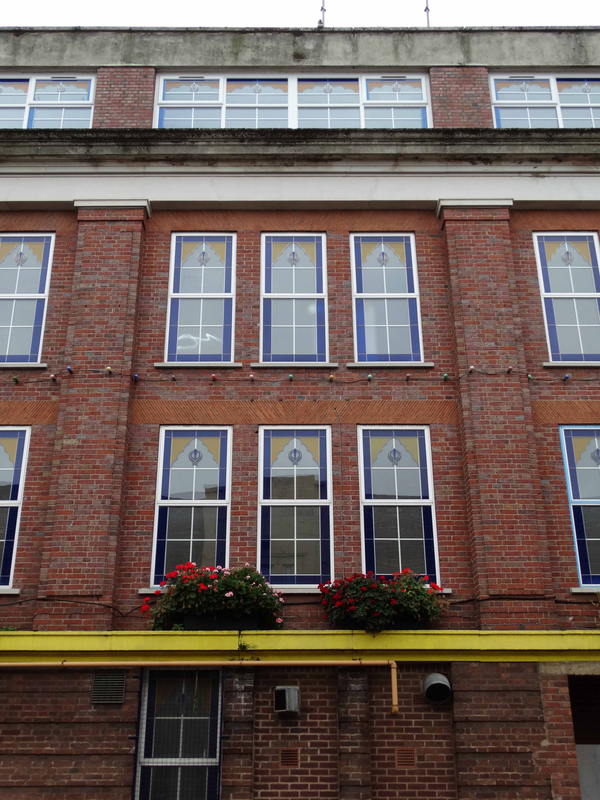 Sikh communities across Leicester act as important custodians of varied Leicester buildings, but also create significant places through their reuse, redevelopment, and constant care. Sikh adaptations and additions to the urban fabric of the city reflect an increasingly public and self-conscious presence, drawing on both local character and Sikh understandings of place. Office of National Statistics. 2012. Religion in England and Wales 2011. [ONLINE] Available at: http://www.ons.gov.uk/peoplepopulationandcommunity/culturalidentity/religion/articles/religioninenglandandwales2011/2012-12-11. [Accessed 29 August 2016].